Record numbers for Christmas Cracked! This year, almost 2,500 children will experience a session of Christmas Cracked! Christmas Cracked is a Bridgebuilder resourced project which enables teams from 31 local churches (either individually or as partnerships) to deliver 43 sessions to primary children in Years 5 or 6. The project provides an opportunity for those children to visit a church close to their school where they can experience a fun, interactive and engaging presentation, designed to help them understand the meaning behind the Christian celebration of Christmas and why the occasion is important to Christians, whilst having the opportunity to visit a local church building at the same time. 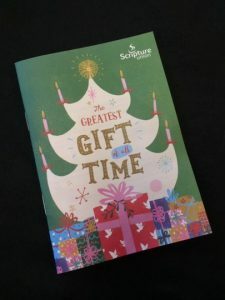 Christmas Cracked will run from Monday 3rd December to Wednesday 19th December this year, and each child will receive a copy of The Greatest Gift of all Time – published by Scripture Union. If you would like a list of schools and dates to pray for the project, please contact the office. Wisdom & Wine – we raised £682.70! During Easter Cracked i learnt Easter is not just about eggs but it’s about a fresh start and a new life.